Twitter has always been limited to 140 characters, which is a holdover from its days as an SMS service. However, earlier this year Twitter started making noise about potentially raising that limit. It began testing an expanded 280 character limit in September, and now that feature is rolling out to everyone. Worried? Twitter says don't sweat it. According to Twitter, fears that a 280 character limit would ruin the brevity of Twitter are unfounded. Its evidence: this graph. 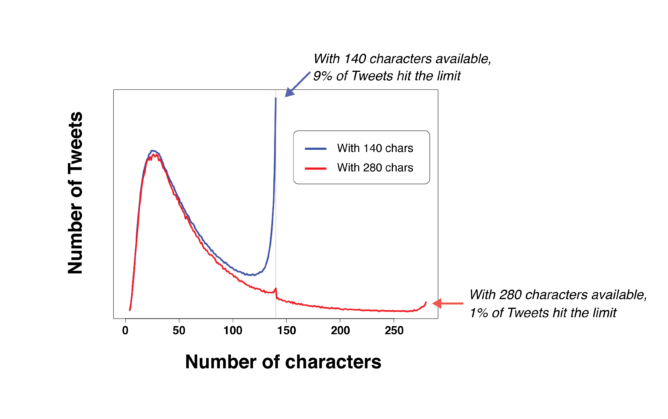 About 9% of tweets bump up against the 140 character limit, but of course, that doesn't include all the tweets that are never sent because people can't say what they want. After enabling 280 characters on a small number of accounts, Twitter says that only 1% of people hit the limit. It was also rare for people to get anywhere near 280 characters—only 2% of tweets were over 190 characters. Tweets with the 280 limit also got more likes and retweets than tweets limited to 140 characters. The new 280 character limit is already hitting the official app, web interface, and Tweetdeck for users in most countries. Instead of a character count, you have a small circle that fills up as you type. However, Japanese, Korean, and Chinese will continue to have the 140 character limit because space is not an issue in these more dense languages. Third-party apps were not able to integrate longer tweets during the test, but presumably that will be an option soon.